Willow Grace: Biko? or Kakanin? I've been thinking about this filipino dessert for months now. 1st off, I couldn't remember what it was called. So I had trouble finding a recipe online for it, and I couldn't find it in my mom's treasure trove of recipes. 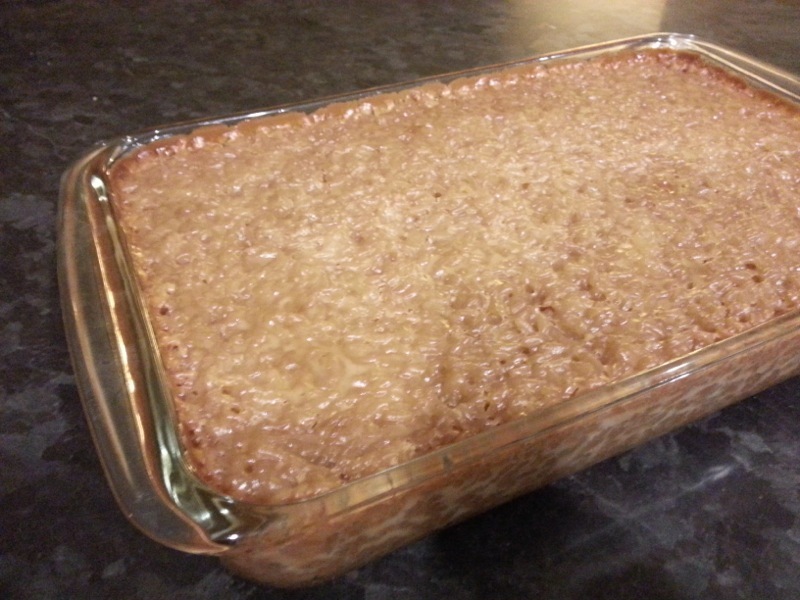 But i did a google search for filipino sticky coconut rice dessert and "Biko" came up. I was pretty sure that wasn't what my mom called it, but all the google images looked like it was the right thing. Anyhoo, I finally found one of her recipes but it wasn't called biko. Maybe because her dialect was Ilicano and she called it something else. Well, apparently I made her recipe in 2005. I write notes on the margins of successes/failures, etc. When I made it, the rice wasn't cooked enough...al dente as I noted it. Her recipe didn't say anything about cooking the rice before baking it. All of the online recipes say to cook the rice before baking it, so that's what I did this time, and I also used this recipe as another guide. I hate to say this, but it was a disappointment. Something wasn't right. I think it was the rice. Where do you find "Sweet Rice"? Online said it was the same as "glutenous rice", so I used what I thought was glutenous rice, the rice I had was labeled 'sushi rice' but it wasn't right. And it wasn't sticky enough, either. Maybe because it said to rinse it and that removed the gluten? And it also tasted like it could have used just a pinch of salt. I might try making it again in another 8 years. But there will never been a substitute for my mom's cooking. Any tips or tricks or hints would be appreciated. In a large pot, bring coconut milk and water to a simmer. Add rice and continue simmering till rice is fully cooked, about 15-20 minutes, stirring continuously so rice doesn't burn. Rice should resemble risotto. Remove from heat. Stir in brown sugar. Pour into a buttered 9x9 baking pan and smooth top evenly. Cover with aluminum foil, bake for 45 minutes. Remove foil and bake an additional 30-45 minutes. Cool slightly before serving. 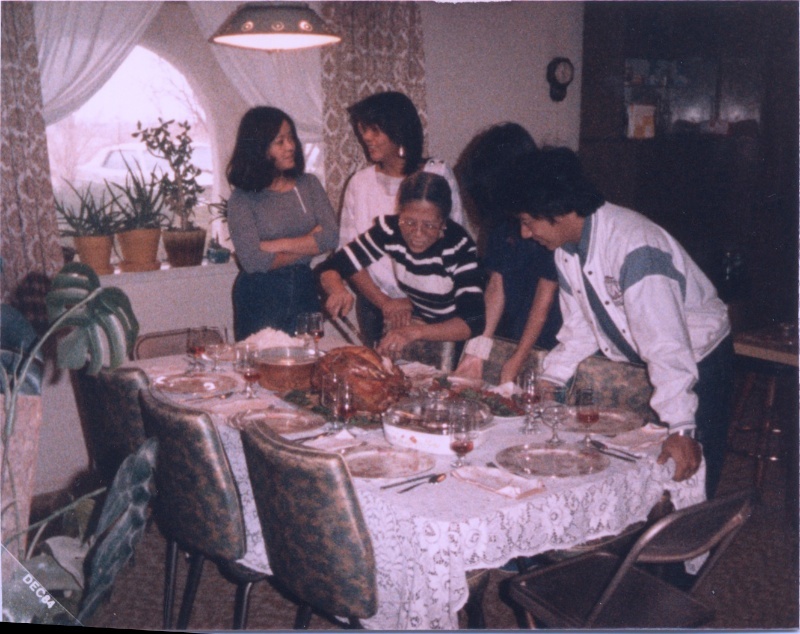 My mom in the center of the action, carving the turkey. 1984.
just go to any asian store and you'll find sticky rice packages in the rice/noodle aisle. i think even lucky has it, don't know about safeway. my dad is ilocano and i grew up in tarlac. we call this kakanin. my mom makes this. i've never liked it at all. but your recipe looks right to me. just change the rice. 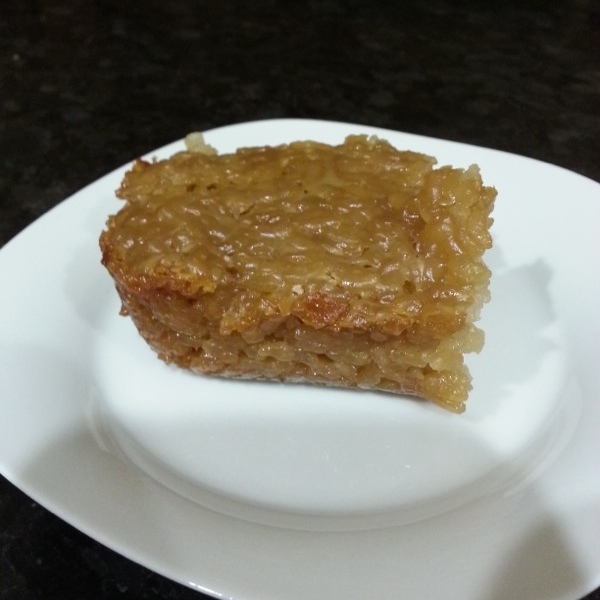 Too bad it didn't taste just like you mum's recipe, but it certainly looks good! Better luck next time!